Dr Melesse Temesgen from Ethiopia is the winner of the Special Prize for innovation with the highest Social Impact given by the African Innovation Foundation. His innovation, the Aybar Broad Based Furrow Maker (BBM), promises to have the greatest social impact. It is estimated that the income of farmers will more than triple as a result of using this technology. Melesse Temesgen did his PhD studies at UNESCO-IHE from 2002 to 2006. The Aybar BBM is a low-cost farming device used to easily drain excess water from waterlogged fields. Dr. Temesgen developed the innovation during his PhD research at UNESCO-IHE. Further development and investigation of its impact was done withing the scope of the Blue Nile Hydrosolidarity project, led by Pieter van der Zaag, Professor of Integrated Water Resources Management. It is the only known effective device capable of creating drainage furrows for excess water while building a broad bed for planting. Up to 5 million hectares of land in Ethiopia and a much larger area in Africa are not available for farming because they are water logged. Using the Aybar BBM re-avails this abandoned land hence improving food production. The Aybar BBM builds on 2,000 years old Ethiopian farming technology, is easy to use and very cost effective. Over 44,000 units have been sold in Ethiopia alone to date. Watch the video of Dr. Melesse Temesgen where he explains about the Aybar BBM. 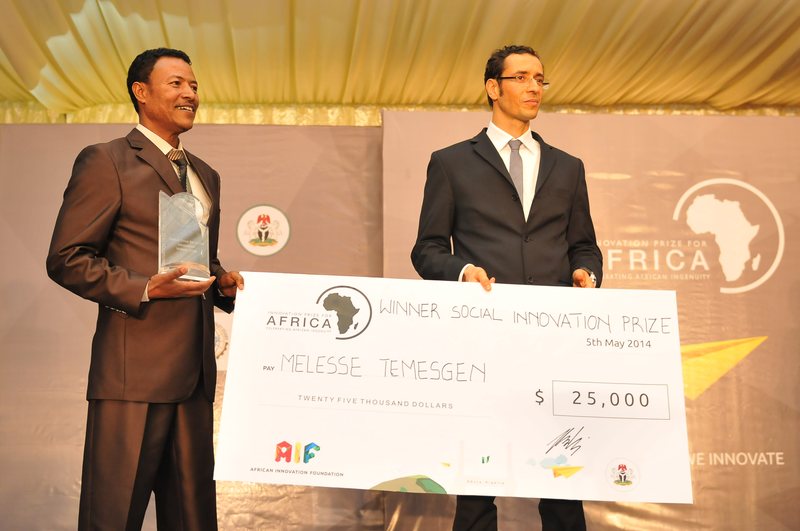 The Innovation Prize for Africa (IPA) is an initiative of the African Innovation Foundation (AIF) that started in 2011. IPA honours and encourages innovative achievements that contribute toward developing new products, increasing efficiency or saving cost in Africa. Specifically, the award targets technological breakthroughs in such main concern areas as manufacturing and service industry, health and well-being, agriculture and agribusiness, environment, energy and water and ICTs. By providing USD 150,000 to winners who deliver market-oriented solutions for African-led development, the IPA acknowledges and encourages the endeavor of innovators and entrepreneurs and works to raise their profiles on the development agenda.